Takeshi Matsuura wins 1A at the 2014 North Japan Regional! We all know Takeshi Matsuura’s mind-blowing 5A skills, and we end up forgetting how incredibly amazing he is at other divisions! Remember 2010? He won both 3A and 5A at Japan Nationals that year. Last weekend, at the 2014 North Japan Regional Yo-yo Contest, held in the cold Sapporo, Takeshi reminded us that his 1A is also top-notch, as he took the top spot with some fantastic tricks! Also worth mentioning is Hiraku Fujii’s victory in 2A. We don’t see Hiraku as often these days, and it’s always great to see him on stage! 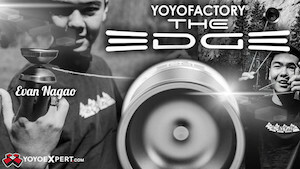 Check the results and winner videos below, courtesy of yoyovideoarchive! The sound is absent in some videos due to YouTube’s copyright policy. “Ninja” Yoshihiro Abe joins Duncan Crew Japan! Yoshihiro Abe is the newest member of Duncan Crew Japan! Photo by Duncan Crew Japan. Yoshihiro, who delighted us with his unforgettable 3rd place winner freestyle at this year’s Japan Nationals, is the first new player to join Duncan Crew Japan in several years. With a North Japan 5A title already under his belt, we’re excited to see what the future holds for this young player!